I’m happy to announce the release of the latest shirt to hit the SimpleBits Shop… the Amp Tee is available for purchase, like right now. The creative brief for this shirt would’ve gone something like this: Draw an ampersand. Make it musical. Refine its shape, but leave it imperfect for a handcrafted finish. Print it big on a heather black, super-soft, 50/50 shirt from American Apparel. Wear it with pride. The creative progress of the ampersand was documented a bit over on Dribbble. Today! Ethan Marcotte‘s brilliant book for A Book Apart is available for purchase. You need to go buy it. Responsive Web Design is not just an assembly of technologies, but rather a new way of approaching designing for the web. To say this book is important would be an understatement. I had the pleasure of doing the technical review of the book. Doing a technical review of anything Ethan writes is bit like trying to find an out-of-place note on Sgt. Pepper. Lots of nodding, belly laughing and, well, learning. (What, you don’t belly laugh to Being For the Benefit of Mr. Kite? Ahem.) I can’t think of a writer I admire more when it comes to the wonderful combination of humor, humility, command of the topic at hand, and a way of explaining it all that makes this stuff fun. That’s not an easy task. We’re at an exciting moment in web design and development. At times it can feel a bit overwhelming with the amount of relearning one must do to stay on top of best practices. Fortunately, these little books from A Book Apart help us get up to speed quickly, with a quality you’d expect from the folks involved. Ethan’s book raises the bar, and pushes the industry foward to a newly-flexible way of constructing the web. 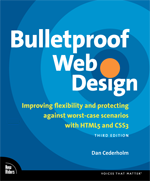 “@abookapart is the Pixar of web design publishing“, says @dirtystylus. I think Ethan just wrote the next box office blockbuster. So I’ve been learning the banjo. At the beginning of 2011, I set out to learn something new—something that had nothing to do with pixels, browser bugs, typing, or angle brackets. I’m not calling it a resolution, as I can’t think of another resolution I’ve ever followed through on completely. But I’ve fallen through on the banjo. Specifically, clawhammer banjo, which is an old time style of playing without finger picks. I’ve been playing music most of my life, starting with drums at age 8, then later guitar, but the banjo has always fascinated me. It’s a peculiar, misunderstood instrument. And it’s difficult to play. Or so I initially thought. Check out Richard Peek’s humorous rant on the two styles of play. The banjo’s been around for hundreds of years and was a very popular instrument prior to World War II. A guy named Earl Scruggs came along and revolutionized the way it was played: three finger style with syncopated rolls and virtuostic finger acrobatics. It’s the style you’ll hear in most bluegrass band setups. It’s wonderful. But it’s damn hard to learn how to play—especially if you have previous experience with the guitar or other stringed instruments. That high barrier to entry arguably led to the dwindling of banjo players over the last half-century. Clawhammer (or frailing) on the other hand, is a method I’ve found far easier to pick up. It’s the way most folks played before the Scruggs style became popular: right hand in a fixed, claw-like position with a single finger nail hammering down on the strings, while the thumb plucks the drone string. Although I’ve found it easier, more natural and simpler, there’s still an amazing variety in the sounds you can get out of the banjo, not to mention it sounds great on its own (where three-finger style sounds best accompanied by a band). This is a photograph of my 5-string banjo. Actually this is only part of it. Fortunately, there’s a real clawhammer banjo master right here in Salem, Tom Collins, and I’ve been taking lessons from him once a month or so. It’s been invaluble to sit down in person in order to figure out what you’re doing right, and what you’re doing wrong. I’ve been learning by being taught to play various tunes. Most of the songs are old time classics that have been passed down from generations of banjo players. When we begin learning something new, we imitate. We learn to mimic people who know what they’re doing. This is OK. We’re not stealing from them (yet) but rather learning by immersion and observation. Another crucial part of learning the banjo (or any instrument for that matter) is repetition. You learn patterns and exercises that are mastered by repeating them over and over and over again. “Muscle memory” kicks in eventually and these patterns become second nature, developing into a vocabulary of sorts. When learning new tunes, having that vocabulary to tap into becomes essential and speeds up the retention of new songs. Lastly, we innovate. By taking the things learned by first mimicking the songs and styles of other players, then piecing patterns together that have been mastered through repetition (Mr. Miyagi knew what he was doing), we’re then ready to add our own details and subtlty. It’s then that we’ve created something unique of our own. Many of the old time standard tunes have countless variations. A single title might sound completely different depending on who you originally learned it from, the geographic region you’re in, etc. Even though the tune is foundationally the same, the creative “top coat” makes it stand on its own, giving it character based on where and who it came from. I’ve been thinking a lot about how you can apply this creative progression to learning just about anything. Including … wait for it … web design. I’m hoping to write a bit more about those connections in the future. Getting this post out was the first step to help me think through it all a bit more. For now, I have tunes to learn and strings to hammer.